As the name suggests, there is a lot of history behind the café at 3 Fleet St (the Fleet Street Press). Not only is it just around the corner from the Devereux (which was once the “Grecian” where Halley met Newton), it is a few doors down from the site of the second ever coffee house established in London (the “Rainbow” was at number 15). There is also plenty of history in the café itself. Fleet St Press operates from a listed building, considered especially noteworthy for its 1912 shop interior (ie. the café). The stained glass at the back of the shop (which was nearly the subject of this cafe-physics review) is apparently original while a sign (for “Tobacco blenders”) in the front window hints at the building’s previous use. Inside, a row of tall stools offers seating along the wall while a large table at the front of the café offers a space to sit more comfortably to enjoy your coffee. 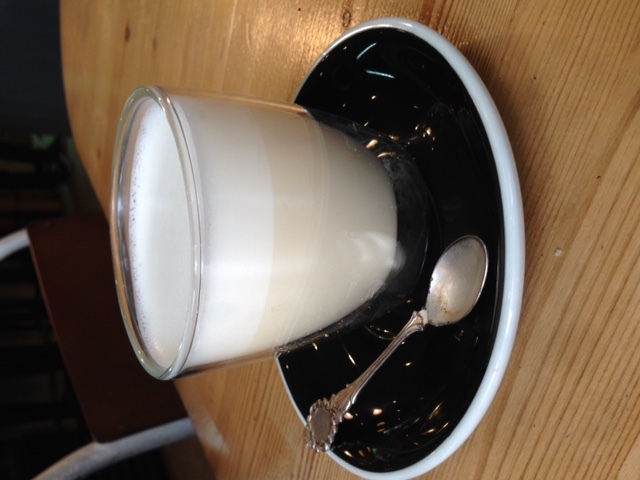 We enjoyed a very nice long black (coffee from Caravan) and a soya hot (white) chocolate. The staff were friendly and it was a lovely space to spend a while. Keep-cups and other coffee making equipment are on sale just next to the counter and the café is just full of things to notice. It’s not just the stained glass. The window to the left of the main door has been stocked with a film camera with flash (presumably a nod to the Fleet St of old), an aeropress, a series of sand-timers and many other items of distraction. 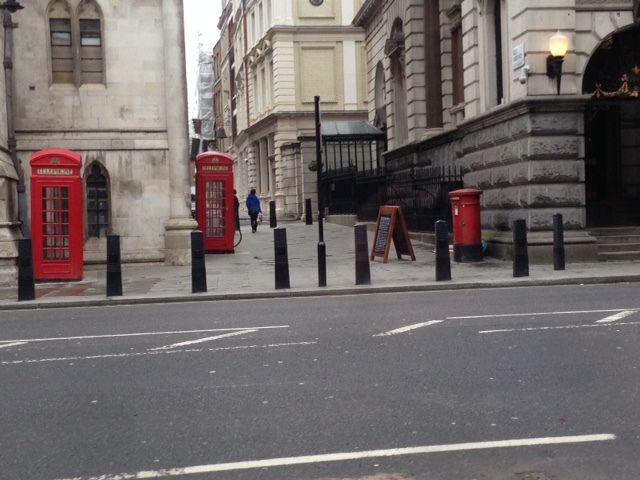 We sat at the window which had a good view towards the Royal Courts of Justice and two wonky K2 telephone boxes. Just across the passageway from the phone boxes was a post box and this got me thinking about communication and how we communicate with each other. In an editorial to a book that rolled off one of Europe’s first printing presses, the Bishop of Aleria, Giovanni de Bussi wrote that printing could be considered an act of generosity “the act of sharing what was hoarded”*†. Since then, the newspapers of the old Fleet St have made way for coffee shops and the papers for the internet. The ‘snail mail’ post box across the road has been almost superseded by email or other forms of internet communication. The telephone box, replaced by mobile phones or Skype. Although we may feel overloaded with information, our ancestors felt the same way. Even in the 1640s it was claimed that they were living in times of a media explosion in which there were just too many books*. So, rather than look at how the scribe gave way to the printing press, books to newspapers, letters to telegraphs and then telephones and now email, Twitter and instant messaging, perhaps it is worth dwelling a short while on what underlies all of these. Indeed, we are so used to what underlies these communication techniques that we may not even notice it. It may be an obvious point but none of these communication methods would have been possible were it not for writing. Given that Homo sapiens are thought to have come out of Africa some 200 000 years ago, and have been farming since 13000 – 8000 BCE, it is perhaps surprising that the first record that we have of a writing system was not until ~3500 BCE. Writing is thought to have originated in Sumer, Mesopotamia as pictographs. Phonographic writing was not developed until later. Shortly afterwards it was again ‘invented’ in Egypt (3150 BCE) and separately in China (1200 BCE) and MesoAmerica (~500BCE). Writing is a surprisingly recent phenomenon. As with the fixtures at Fleet St Press, clues from these earlier cultures pervade the space around us rather like the ghost signs of advertising past. The tobacco sign above the door is suggestive of former occupiers Weingott and Sons. Famous for their pipes, they ran a shop on the site from the mid-nineteenth century until the 1930s. Meanwhile, the writing systems of the ancients lives on both in our alphabet and in our time keeping. Even the name ‘alphabet’ resonates with the history of the Greek “alpha, beta” and the Hebrew “Aleph, Beth” (themselves originating from the Phoenician). The Babylonian number system meanwhile, which dates from around 1800 BCE and used base 60 to count (i.e. rather than 1-9, their number system counted 1-59) echoes down the ages. It is thought that remnants of this system remain both in how we count the degrees of a circle (360) and how we tell the time (60 minutes in an hour, 60 seconds in a minute). Signs and systems that are both instantly familiar and a ghostly ripple from the people of the past. 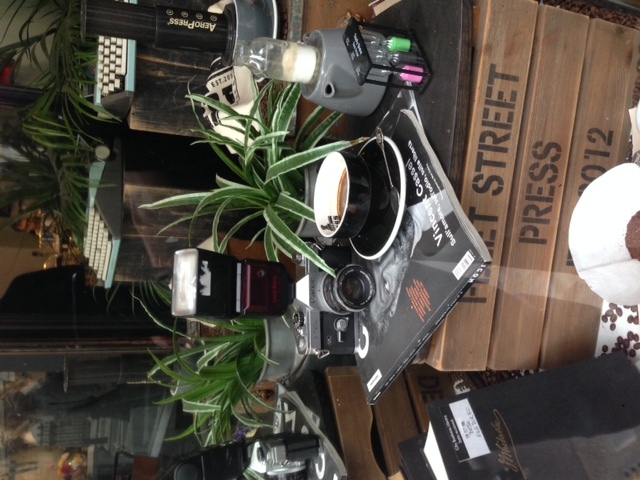 Fleet St Press can be found at 3 Fleet St, EC4Y 1AU. †Quote from de Bussi is as quoted in Divine Art, Infernal Machine on p 15.